Brock Lesnar’s fight will now be the main event of the UFC 200 pay-per-view this Sunday. 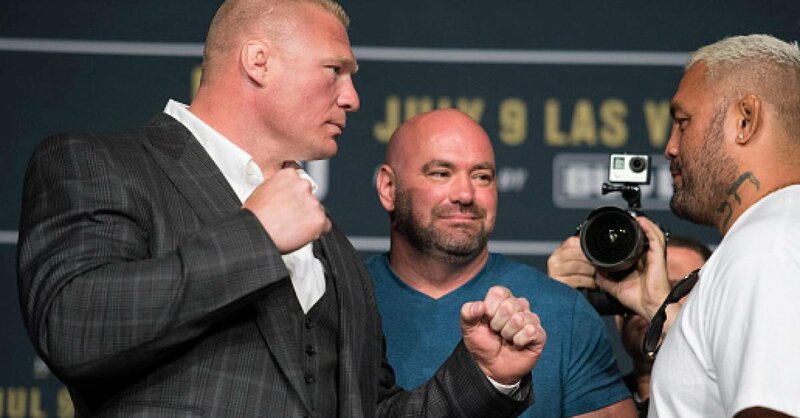 The Ultimate Fighting Championship (UFC) promoted Lesnar vs. New Zealand’s Mark Hunt to the top spot on the card after former headliner Jon Jones allegedly tested positive for a banned substance in an out-of-competition drug test. Lesnar now holds the unique distinction of having fought in the main events of both the UFC 100 and UFC 200 pay-per-views. The WWE Superstar’s heavyweight battle with Hunt remains scheduled for three five-minute rounds. Lesnar, a former UFC heavyweight champion, last fought in the UFC Octagon in December 2011 when he suffered a TKO loss to Alistair Overeem. Lesnar announced his retirement from MMA post-fight, citing health concerns after being plagued by diverticulitis – a bowel disease that caused him have 12 inches of his colon removed. After leaving UFC, Lesnar returned to WWE in April 2012. A bidding war erupted between UFC and WWE when Lesnar’s contract came up for renewal prior to WrestleMania 31. When he re-signed with WWE, Lesnar appeared to close the door on a return to MMA. However, at the UFC 199 pay-per-view last month, Lesnar’s return to the Octagon was announced. “I’m still working for the WWE and still staying in shape and having lots of respect for my body and wanting to compete every day so I never really stepped away from working out or exercise or anything like that,” Lesnar told UFC’s Megan Olivi. Despite Lesnar’s credentials and easy transition to fighting shape, the WWE Superstar has opened as an underdog with odds-makers around the world against knockout artist Hunt. UFC 200 airs on pay-per-view this Sunday, July 10, from 2pm NZST. The event costs $29.99 on Sky Arena.